Swords of Sorrow – The Complete Saga (2016) : Gail Simone, the acclaimed writer of Red Sonja and Birds of Prey, spearheads an epic celebration of iconic female characters with Swords of Sorrow! A genre-spanning, sprawling crossover drawing together Dynamite Entertainment’s beloved heroines, Swords of Sorrow features contributions from an all-star line-up of female writers, including Mairghread Scott, Nancy A. Collins, G. Willow Wilson, Erica Schultz, Leah Moore, Marguerite Bennett, Emma Beeby, and Mikki Kendall. 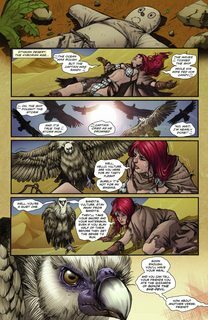 A mysterious woman known only as The Traveller journeys across time and space, bestowing ebony blades to female adventurers like Red Sonja, Dejah Thoris, Vampirella, Jungle Girl, Kato, Lady Zorro, Jennifer Blood, Miss Fury, and many more. Her mission? To prepare a last line of defense against the Prince of All Universes, a lovelorn despot with the power to shatter realities. United by the Swords of Sorrow, these spirited women must face not only the Prince’s legion of Shard Men, but such agents of chaos as Mistress Hel, Purgatori, and Chastity! Featuring the artistic talent of Sergio Dávila, Dave Acosta, Mirka Andolfo, Noah Salonga, Francesco Manna, Crizam Zamora, Rod Rodolfo, and Ronilson Freire, plus a complete cover gallery and an all-new Gail Simone introduction!